I have to start this review by saying that Rich Mullins was the very first Christian artist I ever went out of my way to hear. I had been forced to listen to various 80s artists, and while there was a song or two here and there that I enjoyed, mostly, I'd rather be playing Van Halen, Boston, Cheap Trick, or the Rolling Stones. Yeah, fairly weird mix there, but hey. It is what it is. One of the songs I remember actually liking was by Amy Grant. Sing Your Praise to the Lord. More about that below. Rich Mullins was different. I really didn't know why, but his music always spoke to me. In September, 1997, we had just moved into our first house. I had a four month old baby who was finally wearing newborn clothes. I was listening to Christian radio, unpacking, caring for the baby... and the news came on that Rich Mullins had died in a car accident. I sat down on the floor and sobbed. I've never reacted that way to any other celebrity death. Fast forward to 2014, and a movie about the life of Rich Mullins was coming out. I knew I had to see it. 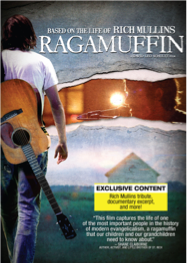 My family bought the Ragamuffin DVD the day it was released to Walmart, and gave it to me for Mother's Day. We watched it, or at least the teens and adults did. I would not recommend this for younger kids (even young teens) until after you have watched it yourself. I have no idea just how accurate the movie is, but it does deal with an abusive father, alcohol issues, and a lot of self-doubt and insecurity. And, of course, Rich dies at the end. This isn't a feel-good, happily ever after flick. This is raw, messed-up, screwed-up life. The message I got from it was that we certainly don't have to have it all together to serve God in some huge and amazing ways. Real people can do so very much. Of course, the fun highlight of the movie for me was when Rich sold a song to Amy Grant. Sing Your Praise to the Lord. I had no idea that song was his. I gave my copy to my church, so I was thrilled to have the opportunity to review this. And I also have the chance to give a copy to one of you. I am somewhat familar with Rich Mullins. I like his song, "Step by Step". I LOVE Creed. Love it. I sing that one in my head all the time. Step by Step is another favorite. It brings back memories of chaperoning the high school kids way back when (late 80s, I suppose, early 90s) and that was a song that we'd do together a lot. I like a lot of his music, but I think Sing Your Praise to the Lord is my favorite. Awesome God is the one I'm most familiar with.